I can’t pinpoint the moment that I decided that a dip in the ocean in New Jersey in early March was a good idea. Perhaps it was during an episode of wistfulness at not having dressed up as Richard—or better yet Pat—Nixon to run in the Phi Psi 500. It also might have been the result of my regretting not wallowing (still in Wahoo regalia, of course) in the red Virginia mud during Easters Weekend at UVa. 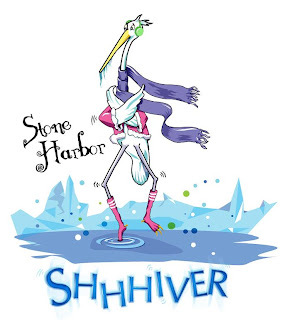 No matter the motivation, the moment they announced the date of the 2013 Stone Harbor Shiver, I was in. And so were my chums Bruce, Martha, and Pam. 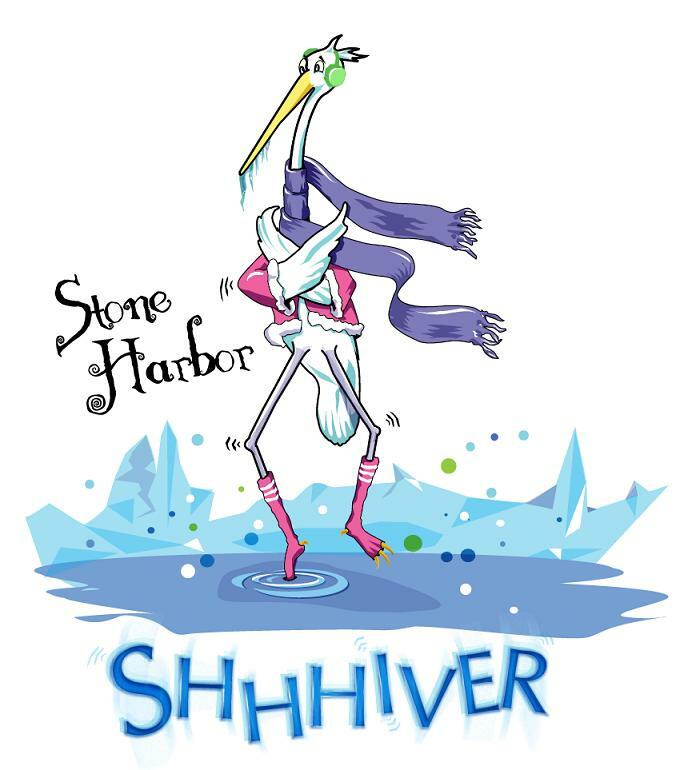 Interestingly enough, the Stone Harbor Shiver—a winter dash into the ocean— raises funds for a Cape May County mental health agency. Doing something crazy in the name of mental health is apparently The Garden State way. 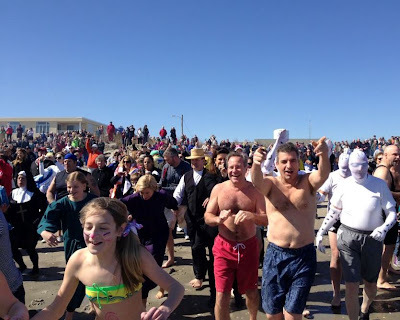 Since there aren’t many tourists in Cape May County in March, the Stone Harbor Chamber of Commerce puts the pedal to the metal with events like this to provide a little economic stimulus while giving the locals (and tourists) an outlet for a winter’s worth of pent up tomfoolery. So it wasn’t just skip into the briny deep and call it a day, but the event included a couple of meals, a costume contest, filming of the obligatory Harlem Shake video, and so on, all in the name of mental health and tourism. The weekend’s festivities started with Friday night buffet supper at the Yacht Club of Stone Harbor. I don’t think of Stone Harbor as a yacht-y sort of place, but nautical types have enjoyed the club for years. The YCSH is located in a small, old-fashioned frame building on the bay—think country club in a town that you didn’t think would have a country club. Even the casual passersby can tell that it’s a yacht club since there are reserved parking spots for the Commodore, Vice-Commodore , Future Imperfect Commodore, and Visiting But Not Staying Too Long Commodore. Unlike the rest of the Commodores, Lionel Richie did not rate his own reserved parking space. The building is decorated in the way you’d expect, with nautical touches here and there. There were a couple of big reception rooms with a long narrow bar facing the bay. At least I think the bay was out there, it was dark at the time and I didn’t feel the need to take a long walk off a short yacht club deck. Stone Harbor’s Mayor-for-Life Suzanne V. Walters came by our table to chit chat. We told her that our costumes for the parade were inspired by the anecdote she told us eons ago during one of her star turns as a waitress at the annual Lions Club Pancake Breakfast. While she was shoveling out the short stacks she told us that shortly after she moved to Stone Harbor, the cliff dwellers on the Stone Harbor Borough Council accused her of being an "itinerant speculator" when she went before them to get a zoning variance in order to add a dormer to her home. After a couple of chuckles, well, shouting chuckles, it was loud in there, she set us straight that she was accused of being a transient speculator rather than an itinerant speculator, meaning that we (as in Martha) had to re-logo our costumes. Saturday’s events kicked off at 9:30 with Kegs and Eggs at Fred’s Tavern. We chowed down on our eggs at home, but managed to get our stuff together and in plenty of time for a spin through Fred's to see what the bar flies were wearing and the the costume parade down 96th St. to the beach. We would have been even earlier except for the slight delay caused by my shutting Pam’s hand in the car door. There were about 25 different groups in costumes, from Dr. Seuss characters to some folks dressed as skunks toting signs that said “We Skunked Superstorm Sandy”. Someone should tell this fellow that if you are going to dress in spandex you should have a bigger dachshund. Pam, Bruce, Martha and I dressed as construction workers and called our group Demo Sale. A demo sale is what takes place just before a modestly-sized house is demolished (hence demo) and a McMansion put in its place. Builders try to squeeze every ounce of moola out of the house before it’s demolished so everything is for sale. And I do mean everything. You’re quite welcome to make an offer on the kitchen, the bathroom, windows, or anything else you can saw away from the carcass of a perfectly nice 1960s cottage. Otherwise, the contractor is going to have to pay to dispose of it next to a long lost mafia don in one of the Garden State’s finer landfills. In a way it’s like going to the dog pound: whatever you don’t take home doesn’t have much of a future. So we dressed as construction workers and all wore cardboard signs around our necks, just like the signs you see at the street corner with an arrow pointing at the house that’s about a day from the wrecking ball. On the back of our signs, we’d written a somewhat political message. There were four signs and so they said in order, Tearing Down, Building Up, Cashing In, and Moving On. Just like real itinerant, no, transient speculators. Tableaux vivant, meet performance art. I love women (and men too) in nun costumes as much as the Protestant, but wearing a rented costume is a big fail in my book. But these nuns were jolly and boozy and smoked up a storm. They had the whole nun thing going on expect for rapping boys on the knuckles with a ruler. Somehow I never got around to asking them if they knew the joke about the Mother Superior’s constipation. There was one solitary guy in bad drag. He didn’t seem to have any friends so I wondered if he was just using the opportunity to get his freak on in a kicky thrifted number from the Jacklyn Smith Collection at K-Mart not to mention bone colored heels (before Easter—egad!). There were stogie chomping golfers wearing several different kinds of plaid, and hula skirted folks also pretending to enjoy a La Stinkadora. It’s interesting how many people think a big stogie makes any bad costume so much better. I always wonder how often those folks dream about trains going into tunnels. The local ice company created a rudimentary truck-mounted ice throne for the King and Queen of the Shiver. I could tell that they were the King and Queen since they were wearing crowns and he was carrying a scepter; his orb must have been at the shop. Shortly after I said hello to the King of the Shiver he laid into me like nobody’s business for wearing a nail apron from Lowe’s instead of the just down the street Seashore Ace, which, he pointed out with a snarl was having Free Paint Day. I didn’t take the time to point out to Good King Frozenballs that free paint didn’t do me much good when I really wanted a nail apron. As my inner Madame DeFarge started telling me “knit one purl two”, I walked away thinking that this jerk never heard of getting more flies with honey than you do with driveway sealer. After the Kegs and Eggs were kicked, it was time to process to the parking lot of the Women’s Civic Club parking lot where the costume judging would take place. The two sets of judges, King Frozenballs and his Queen, and Mayor for Life Walters and another local nabob, sat in lifeguard chairs, just like real lifeguards except not as hot. I mean, not hot at all. In fact, as far as fantasy constructs go, they were probably colder than the Atlantic Ocean. But that’s just me, there is probably an adults-only web site devoted to hot Garden State costume contest judges. I took pains to point out to King Frozenballs that I’d turned my nail apron backwards so that the Lowe’s logo didn’t show he said that it was a good thing or else we’d have gotten a one from him. All class that guy. Some of the costumes were cute but lots were well, bad. Alas and alack we didn’t win. We were beaten out by a group dressed as a turtle crossing. And they deserved to win, they had a great costume and a little performance too. After the costume contest, it was time to do the Harlem Shake (naturally) and then time to head to the beach, where there were even more people milling about. There were also a bunch of emergency vehicles parked on the beach. Not so reassuring. As soon as we got to the beach people started to strip off their layers of clothing, and someone stood on a lifeguard stand to read instructions through a megaphone to the crowd. At least I am guessing they were instructions. They sounded a bit like an announcement at the airport that your flight to Omaha is delayed or maybe at a different gate or did they say it was cancelled or was that is now ready for boarding? Then there was a whistle and suddenly everyone made a mad dash for the water. That is, everyone but Bruce who stayed behind to hold our towels. The water was cold, alright. Forty-one degrees Fahrenheit to be exact. But I ran all the way in, and once I’d dunked myself entirely I ran out just as fast as I could. I think I might have been in the water a minute, and well, there was about a year’s worth of shrinkage in that minute. I figure I’ll move from soprano to tenor in time for the Arts Festival in July. I’m not sure that I’ll ever get back to my pre-shiver baritone. After we finally warmed up and changed clothes, we went out for a celebratory dinner, a postprandial kerfuffle with an unmanned toll booth on the Garden State Parkway, and a victory lap at Fred’s Tavern. Of course, we could have done those things any weekend. But this time I, at least, was secure in the knowledge that while I might not have been dressed as Richard —or better yet Pat—Nixon, or covered in the red earth central Virginia, I was still stupid enough to run into a really, really cold ocean just for fun.